Founded in 1989, Maple Roofing Supplies is a family owned and operated business, located in the heart of Richmond Hill. 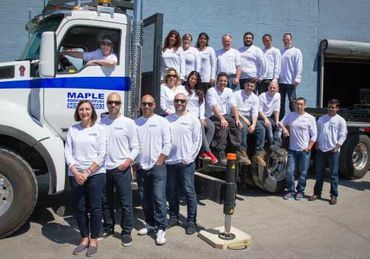 Our family has worked hard to make Maple Roofing Supplies stand out from the competition, striving to make everybody from our employees to our customers a part of our family. Our personable staff make it a priority to create lasting relationships with our customers. From sales and customer service to delivery and beyond, our customers can expect exceptional customer service, knowledge and support from our team. We are dedicated to accommodating all of our customers’ requests and ensuring that they have a positive experience. We continue to expand in our team and equipment in order to be able to better service our growing customer base. We are proud to have built a reputation on reliability, dependability, product availability, quality service and trust. For more information on our company and services, give us a call today.